Christmas is every year, but Kuninkuusravit only once a year! This year the biggest harness racing event in Finland, the Kuninkuusravit, will take place at Joensuu, in Eastern Finland on 1st and 2nd of August, 2015. We still don’t know the 12 stallions and 12 mares that will get to race for the crowns, but the rankings will keep the speculations going until the signing day. I have come across a few different translations for the name of this event. Should “Kuninkuusravit” be translated as the Coronation Trot, the Royal Race(s), the finnhorse Trotting Championships or something else? All of these seem to fit to the definition – it’s an annual horse racing event where the best trotters of this breed compete for the titles of King and Queen (kuningas = king in Finnish, kuninkuus = royalty). Another ad for this year’s event. The Royal Race, an annual competition for Finnhorse, is held this year in Joensuu, the heart of North Karelia. It is the greatest harness racing event in Finland, and gathers approximately 60 000 spectators every year. It has been held three times before in Joensuu. This year the Royal Race is raced for the 84th time. The competitors – 12 stallions and 12 mares – participate for three partial races. On Saturday, the first competition day, the horses race 2100 meters. On Sunday, the second competition day, the first race’s length is one mile (1609 meters) and the second race, the most demanding of all, is 3100 meters. The Royal Race has been said to be one of the hardest competitions in harness racing worldwide, as the horses must race three times in two days. The winners of overall competitions will be crowned as the Trotting King and the Trotting Queen, and winning these titles is highly appreciated. The first Royal Races were held already in 1924. The Royal Races in Joensuu have quite a remarkable meaning in the history of this amazing event: in the 1948 competition the King and Queen were both selected, as until that the stallions and mares were competing together. Year 1984 is remembered for one man and his talent: Pentti Savolainen was the breeder, owner, trainer and driver of both the King Vekseli and the Queen Vekkuliina. This is considered to be an unbreakable record. At the latest Royal Races, year 2000, Viesker (which many consider to be “the greatest racing Finnhorse in history”) was crowned as the King – for the fifth time in a row! Only two other stallions – Vieteri and Vekseli – have succeeded five times, but not consecutively. Although the Finnhorse is the main attraction, there are many more great events during the weekend. Finnish Championship of Monté, a French-originating sport where the trotters are actually ridden, not driven, is exciting and speedy race. While most of the drivers are men, most of the riders are women: one would be amazed of their strength. Many more races with top-class horses fill the air with excitement and the thrill of betting. The evening party has well-known artists and it serves as an annual get-together for those, who dedicate their life to the world of horse sports. 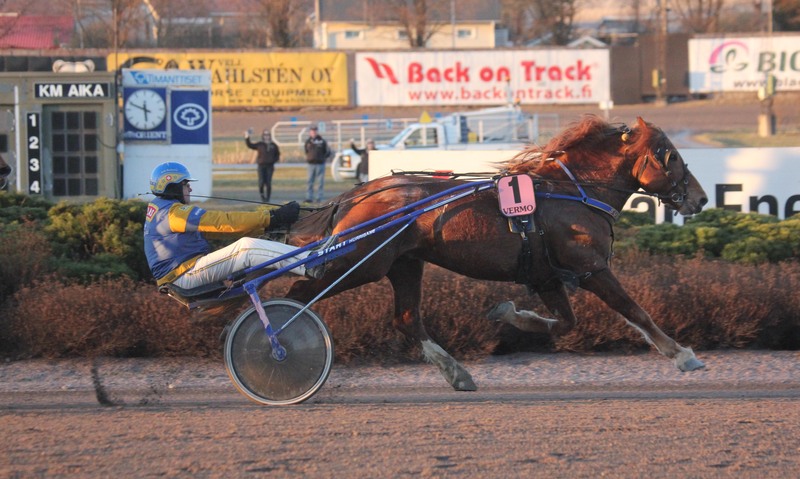 Categories: Harness racing, Video | Tags: finnhorse, harness racing, kuninkuusravit | Permalink. Would you like to be a (Finn)horse owner? Trot League, or Raviliiga in Finnish, is a project that aims to provide positive, low-risk experiences of horse ownership. The idea comes from Sweden, where Rikstravet is already a thing. Finnish Raviliiga started in 2013 with eight teams and eight standardbred yearlings, each of which has 700 owners. In 2014 the amount of shares will be 800 per horse. One share of a horse for three years costs 100 €, with no additional cost whatsoever. You could say this must be the easiest and also a very cheap way to own a horse! The horses live and train in professional trainers’ stables, so ownership doesn’t require any experience about horses. People have a great opportunity to get to know people and structures behind horse racing as a horse owner. The League started off so well, that the project received an award for its success. It has introduced hundreds of new people to horses. In my opinion this is the way to market horse racing -through horses themselves, not betting or other trivia. The project has received quite much feedback, mostly positive and excited. But what seemed to trouble people the most was the fact that there weren’t any finnhorses in the league. In 2014 the new teams have a chance to choose between a finnhorse and a standardbred -both breeds get their own leagues. Each team chooses a professional horse trainer, and trainers get to choose the horses. The standardbreds are bought as yearlings and finnhorses as 2,5-year-olds. The participating race tracks will announce their choices (finnhorse or standardbred league) soon. I have to say, I’m excited! Categories: Breeding & pedigrees, Harness racing | Tags: Finland, finnhorse, harness racing, horse ownership, Raviliiga | Permalink. Finnish, Swedish and Norwegian coldblood trotter horses race once a year in France. Each team consists of four horses. They race twice on the famous Vincennes track in Paris, at Prix des Trotteurs Sang Froid on 20th and at Prix des Pays Nordiques Trophée Järvsöfaks on 23rd of February 2014. The Finns have been eager to attend the Paris trip, this year we even got an elimination race in Vermo on Wednesday (January 29th)! Two best horses from this race get tickets to Paris and two others are chosen from those who sign up. Categories: Harness racing | Tags: harness racing, Paris, Prix de Trophée Järvsöfaks, Prix Des Pays Nordiques, raviurheilu, Vermo, Vieskerin Valo, Vincennes | Permalink. Liising has covered 150 mares a year for the last four years and already has over 600 foals progeny. Owner Juha Kortekallio refers to him as a humble worker with good nerves. “Also his foals are great race horses. They are fast to develop but have enough humour to race also as adults. They are easy to handle at home but tough on the track”. In Liising’s case the mares are covered through artificial insemination. His sperm takes the freezing well, the maximum amount of mares for one stud is 150 per year. The foaling percent is about 70, giving Liising about 100 foals progeny per year. Kortekallio thinks that it’s an easier task for a Finnish breeder to have finnhorses than other breeds, since all the best horses of this breed are in Finland. “The breeder has a chance to see all the stallions live quite easily”, he says. The best race horses can earn a living, but how about horse breeding? “It’s not financially profitable by any means, but for most of us it’s a lifestyle. Luckily we have got the annual Coronation Trot event. Every breeder and owner wishes to have their horse competing there one day and that’s what keeps them trying”. Categories: Breeding & pedigrees, Harness racing | Tags: Finland, finnhorse, harness racing, Liising | Permalink. Categories: Art & Culture, Harness racing | Tags: Finland, finnhorse, harness racing, photo, suomenhevonen | Permalink.